I've got a picture essay going right now over on the Iron Brush Forum for a carving I've been working on the past two weeks. Please have a look if you're interested in seeing how a design evolves. A lot of the small-scale carvings I create can be considered netsuke, in terms of size, and function- though probably not in terms of getting much active wear (both meanings of the word intended) as examples from the past can claim. 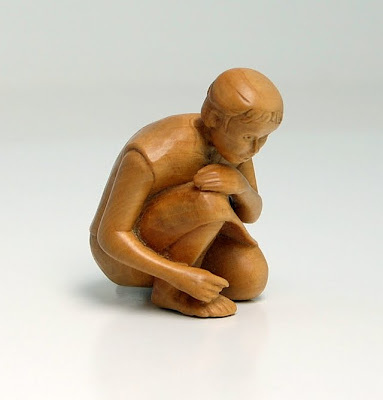 Now of course artists are free to do what pleases them, and the world, albeit small, of contemporary netsuke contains all sorts of styles and trends. 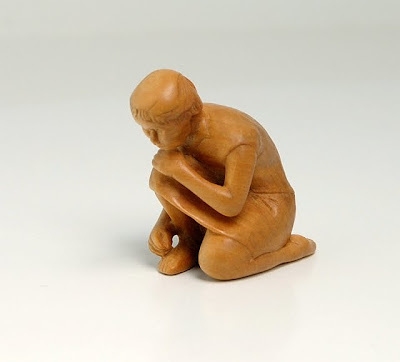 One that I'd like to comment on is what I see to be the growing habit of coloring netsuke- either with lacquer or various modern synthetic dyes and paints. To me, they look jarring to the eye and lack the subtle beauty found in the coloration of natural materials- wood, horn, antler, amber to name a few materials. "What are we to make of Riemenschneider's crucial move from colored sculpture to monochrome sculpture? It is important to keep in mind that, through monochrome, the sculpture was not just bare wood: it was varnished with a unifying brown compound; and a few details, such as lips and the pupils of eyes, were still pigmented [...] but these matters apart, what are the perceptual consequences of the new monochromy? For us, accustomed to seeing unpigmented sculpture, there is not as great a jolt of strangeness as there must have been in the 1490's. But a basic shift in experience can still be appreciated. 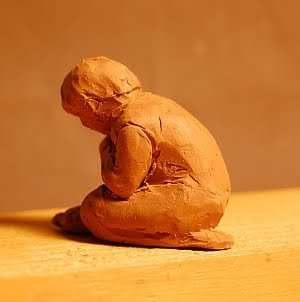 In polychrome sculpture we tend to see the statue as a surrogate person [or bird, or frog or apple]. 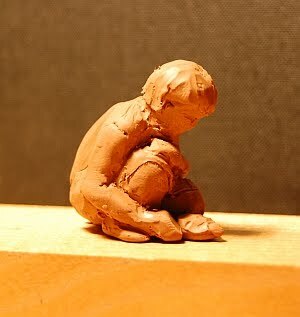 In monochrome sculpture we see a figure in a worked material; we are more aware of the substance of the sculpture, and so of the work as representation. We are, and must be, more active in our address to monochrome sculpture: we contribute more to the perception. We see it as wood, for example, and we know it is a carving; we project the human figure into it more energetically and enjoy our part in the transaction. 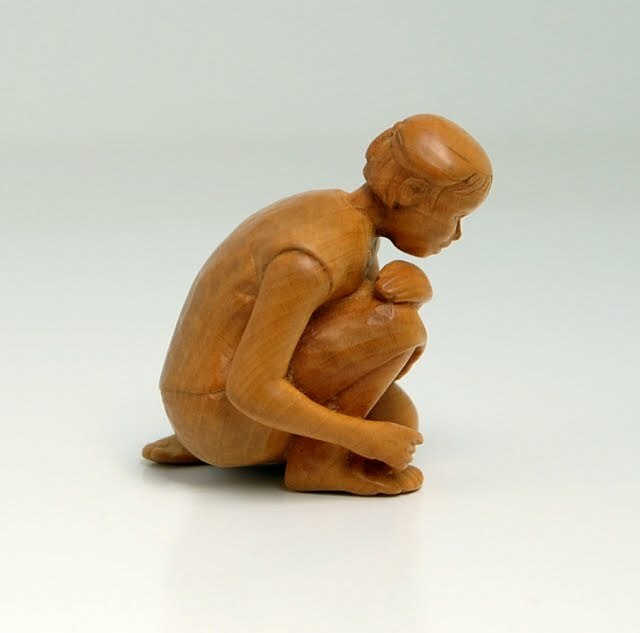 And since we ourselves have had much to do with creating the human being in the wood, our experience of it is stronger. Estrangement stimulates projection." There are apparently a number of theories why this shift occured- not the least of which was the dissemenation of black/white pictorial prints - think Durer and Schongauer- that enabled people to appreciate the subtlety of light and shadow and monochrome. 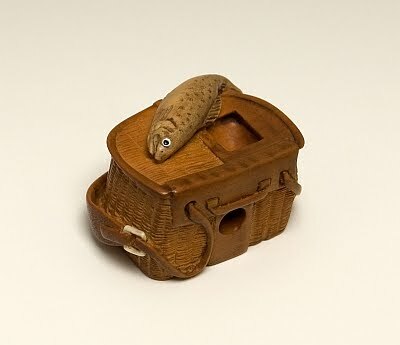 What is interesting to consider is why are netsuke now being colored so often, to me, in such an artifical and distracting manner? I look alot at Japanese sword fittings, kodogu, for ideas and solutions. Unfortunately most are made of metal and show colors and techniques that are difficult to reproduce in wood and other organic materials. The trick is to learn from the compositions and handling of subject matter, but translate them into effects inherent in the other materials with which I'm familiar. 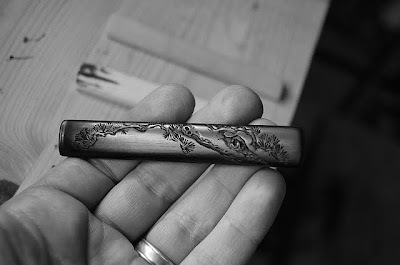 Kozuka in particular present wonderful solutions to the challenge of a very long, narrow composition. Japanese pillar prints, hashira-e, also have this constrained format. 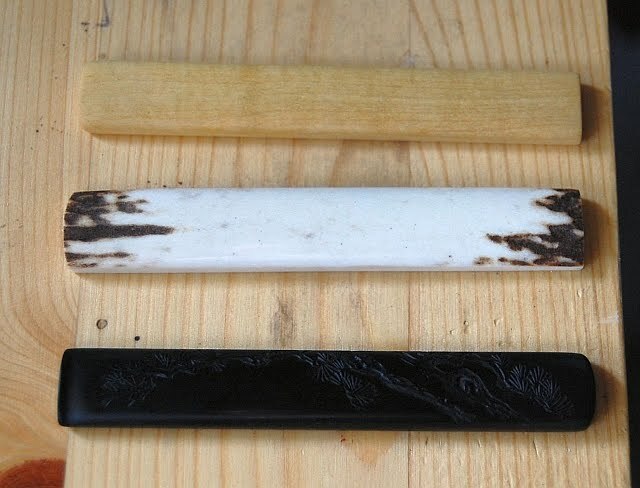 Some, but very few kozuka have been made of organic materials such as antler, wood or horn. The difficulty is in the foming of the slot to fit the tang of the blade. It has to be about 2mm high, by 8mm wide and 75 mm deep. The walls around this are quite thin too. The metal ones are no problem- they're formed by folding a flat piece of metal to form the four sides with the final seam soldered. 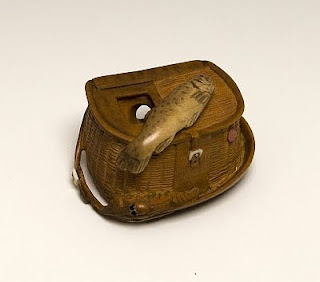 For wooden ones, I suspect the wood blank was mounted on a type of lathe, with a boring bit driven into it in places and then a long, thin chisel used to straighten up the pocket. Modern drill bits (at least those I've found) are too short, and tend to deviate off center as they're bored down into endgrain. Don't have the chisels either. I took the problem to the machine shop of the chemistry/physics department of the university where work and the old timers there couldn't figure out how to do it with modern milling equipment, leaving me at a dead end. So, long story short, I made a few blanks- box, antler and ebony, and worked up the latter just to see how one might go about it, minus the hole. The ebony one measures 9.8cm long, and is a copy of one in metal by Masayoshi Ishiguro, mid 19th century. 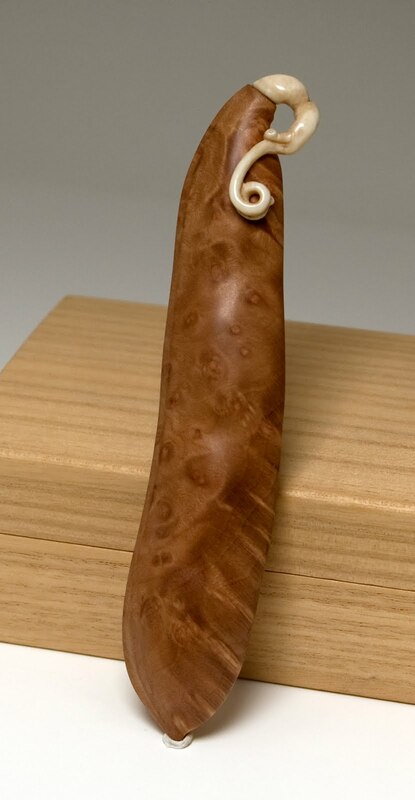 The exercise got me thinking about working in shallow relief to great detail and translating this into a functional netsuke as a functional kozuka is out of the question for me right now. I finished this one months ago, but couldn't get a photo I was happy with. It's 3.7cm high in boxwood. I'd like to do a companion piece for her which I think will be a bead, so that it functions as a netsuke and ojime ensemble. 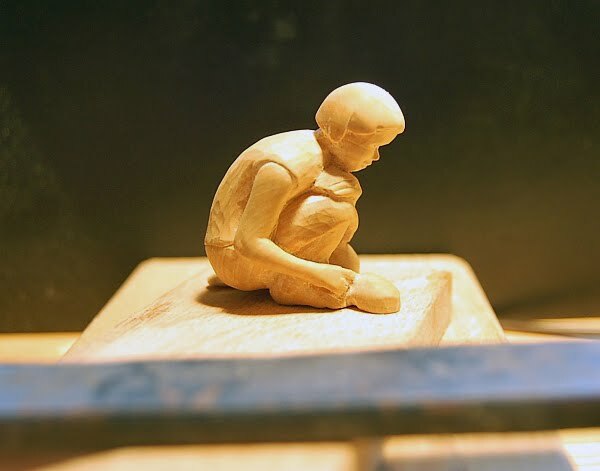 I'll be demonstrating some techniques of small-scale carving at the Edgewood Orchard Gallery in northern Wisconsin the afternoon of July 22nd. 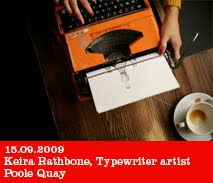 If anyone out there reading my blog lives in the area, please come and have a look. 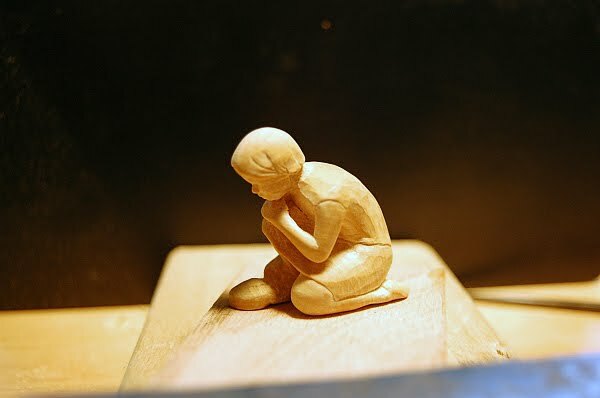 I'll have some carvings in a number of production stages ans will be happy to answer questions. Also on that day they've got a plein air painting festival going on, so it looks as though it will be lots to see and do. No update today; only a link. Have a look and enjoy the voices and photos. Thanks for pedalling and looking Mr. Hand. Here's an update from work done over the weekend. It's coming together well- but the trouble is that her gaze isn't as downwards as originally planned, to be looking at the turtle by her feet. I may need to change the plan a bit and introduce another element, to make things work out. I spent my nights this past week working on the new carving. Last week, a friend of mine was kind enough to ask her daughter to pose for a few photographs so I could be sure things were in the right place. Nothing beats a model for reference! The pictures show most of the volumes blocked in. From here, it's gradual refinement with blade tools and then on to the use of scrapers for finer surfaces and details. This is actually the second version of the piece. The first one, started Monday, seemed like it was going well until I realized that the head was not quite in the right position (anatomically) in relation to the shoulders so I had to scrap it and start over. My best boxwood too. 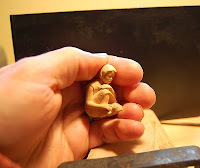 I made a few sketches this week and sculpted a small model of a piece I'll be starting in wood soon. This piece was created in respose to a call for a group show at Edgewood Orchard Gallery, where I exhibit. The theme is 'Daybreak' so I thought the subject of a fly-fishing outing was a perfect response. One trout caught, and a crayfish along for good measure. This netsuke carving is in boxwood, with ivory, mother of pearl and pink ivory wood accents. It measures 1 1/2" at its greatest dimension. The himotoshi is formed by the natural opening in the lid of the creel. A knotted cord will nest nicely in here. If you're up in Door County, Wisconsin this summer, please have a look. Many of my latest carvings will be available for sale. 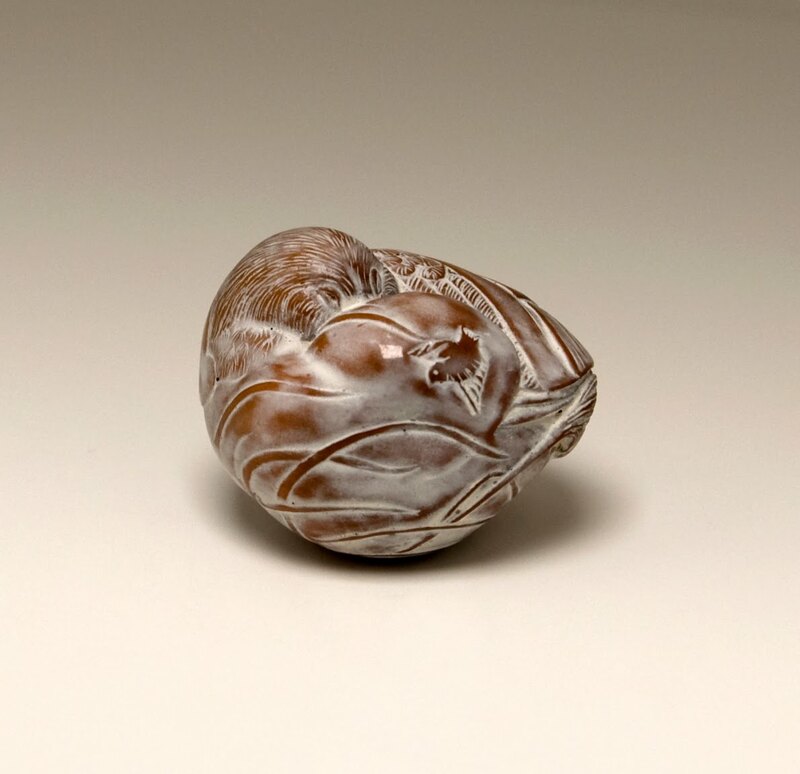 Here's another carving: a sashi-style netsuke which I recently finished after working with for a couple of months. The artist Jacques Vesery sent me a box of wood offcuts from his studio a number of years ago. Pieces from that gift- thanks again Jacques!- have been used as details in a number of my works, but most notably in this one. It hit me towards the end of last year that this piece of burlwood would be perfect as a long bean pod. The grain of it suggested something growing organically, and the streaks scross the lower surface reminded me of dappled rays of sunlight filtering through leaves and vines. The details are of ivory which has been lightly colored. 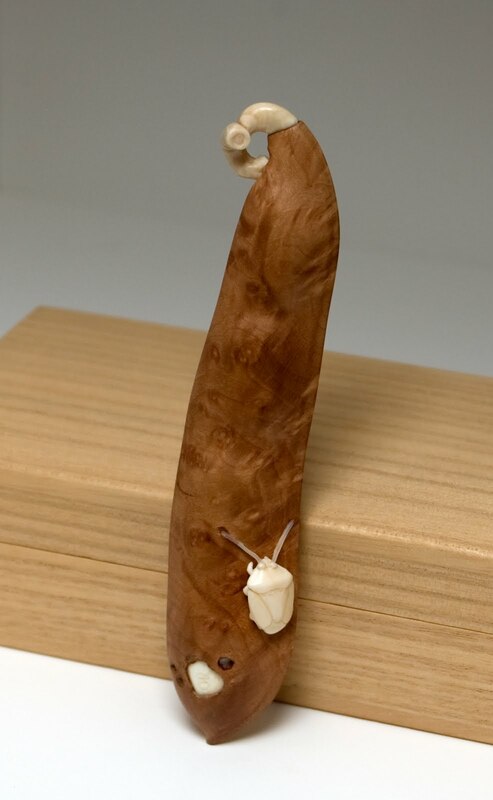 As you can see on the back, there's a stink bug with antennae made from boar's tusk, and part of the pod has been cut away to reveal a bean beneath. I've done several bean pods over the years- they're great to come back to, to gauge one's development as an artist- the form of them can go in lovely, sensuous directions too. 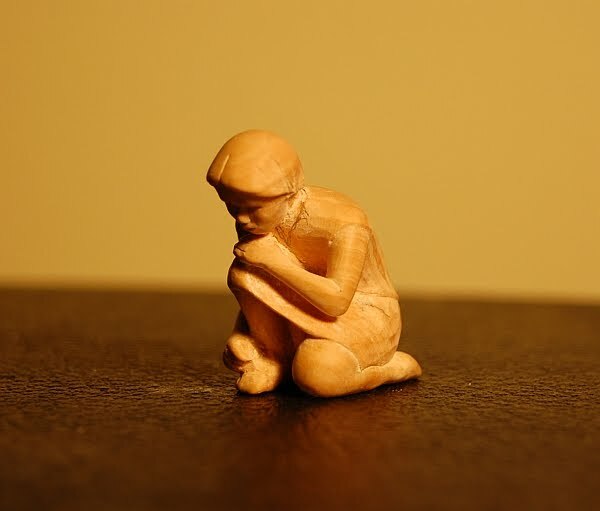 I create some of my carvings because I'm drawn to a particular subject or theme and want to try expressing it with my hands. Other times, I have a vague story or narrative in mind and I try to capture it in a piece. This piece came to me one day this past winter seeing sparrows outside- some were huddled up against the cold- others hopping from branch to grass in search of food. Then I began thinking about a sort of mother sparrow- or a sparrow spirit that would look after the birds and give them comfort in an intagible way. 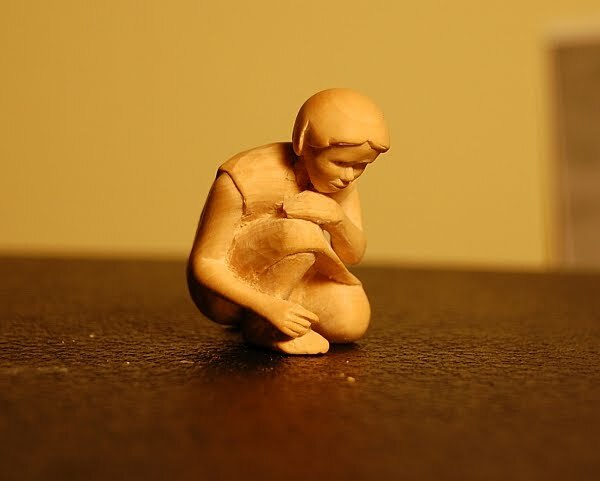 The result is this carving. I experimented a bit with combining a three-dimensional form with low relief carvings on the surface to create another layer of narrative. I'm happy with the initial results and may come back to this device in the future. 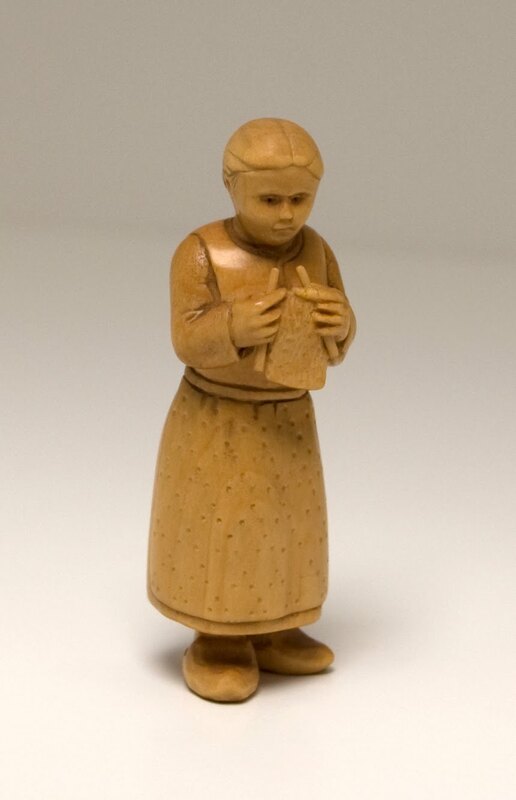 The item is carved in boxwood which has been chemically stained and then washed over with the white pigment, gofun. After that, the piece was burnished with an agate to a high gloss. Dimension is roughly 1 3/4" . I finished this carving up last November. It's of boxwood and lightly stained with alder dye. Not much to say about it. I wanted to try working on another figural netsuke and was looking at some paintings and drawings by Millet and thought it would make a good subject to do a young peasant girl knitting. 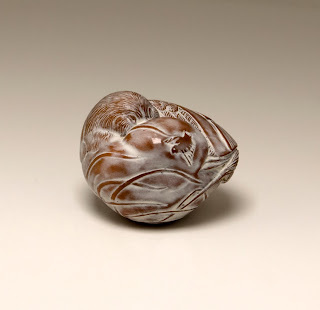 I may make a matching ojime for this netsuke in the shape of a basket holding some balls of wool.